Elbert Williams is the first known member of the National Association of the Advancement of Colored People (NAACP) to be murdered for his civil rights activities. Williams was born on October 15, 1908, in rural Haywood County, Tennessee, the son of farmer Albert Williams and wife Mary Green Williams. In 1929 Williams married Annie Mitchell. After trying farming, the couple moved in the early 1930s to Brownsville where they worked for the Sunshine laundry until Williams’ murder in 1940. In 1939 the Williamses became charter members of Brownsville’s NAACP Branch. On May 6, 1940, five members of Brownsville’s NAACP Branch unsuccessfully attempted to register to vote. No African American had been allowed to register to vote in Haywood County during the Twentieth Century. The next day threats began. 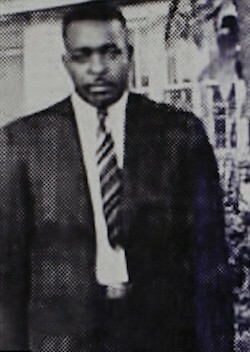 Early in the morning of June 16, 1940, would-be registrant Elisha Davis was abducted from home by a white mob led by Brownsville policemen Tip Hunter and Charles Read, taken to the nearby Hatchie River Swamp, surrounded, and threatened with death unless he named members of the Brownsville NAACP. After naming some, Davis was forced to immediately leave the county, under threat of death should he ever return. Upon hearing of the Davis incident many African American families fled Haywood County as well. The Williamses did not. Late night on June 20, 1940, uniformed policemen Hunter and Read, and a third man, Ed Lee, manager of the local Coca-Cola bottling company, took Williams from his home, jailed him, and questioned him about an NAACP meeting he was suspected of planning. Hunter claimed that he released Williams, who never returned home, and was never again seen alive. Under pressure from the NAACP National Office, the United States Department of Justice (DOJ) ordered the Federal Bureau of Investigation (FBI) to investigate, and promised a broad inquiry. NAACP Special Counsel Thurgood Marshall, later a United States Supreme Court Justice, monitored the DOJ/FBI investigation, and travelled to Brownsville in 1940 to collect evidence.The DOJ ordered the United States Attorney in Memphis to present the case to a Federal Grand Jury, but then mysteriously reversed its decision and closed the case, citing insufficient evidence. Thurgood Marshall was livid, but unable to get the case reopened. Elbert Williams’s murderer has not been prosecuted.The Elbert Williams Memorial Committee was formed in 2014 to bring attention to the long dormant murder case. In early 2015, the Tennessee Historical Commission granted the Committee’s application for an official historical marker honoring Williams. On June 20, 2015, the seventy-fifth anniversary of Williams’s death, a memorial service and a dedication of the historical marker were held in Brownsville, Tennessee. The featured speaker was NAACP President Cornell W. Brooks. The DOJ has under consideration this contributor’s request to reopen its investigation into Williams’s death. Patricia Sullivan, Lift Every Voice, The NAACP and the Making of the Civil Rights Movement (New York: The New Press, 2009); Richard A. Couto,Lifting the Veil, A Political History of Struggles for Emancipation (Knoxville: The University of Tennessee Press, 1993); Raye Springfield, The Legacy of Tamar, Courage and Faith in an African American Family (Knoxville: University of Tennessee Press, 2000).